The parents of the Virgin Mary, Sts. Joachim and Anna, praying for an end to their childlessness, vowed that if a child were born to them, they would dedicate the child to the service of God. the Temple, 15 high steps led to the sanctuary. The small child, strengthened by the power of God, quickly ascended to the top of the steps. 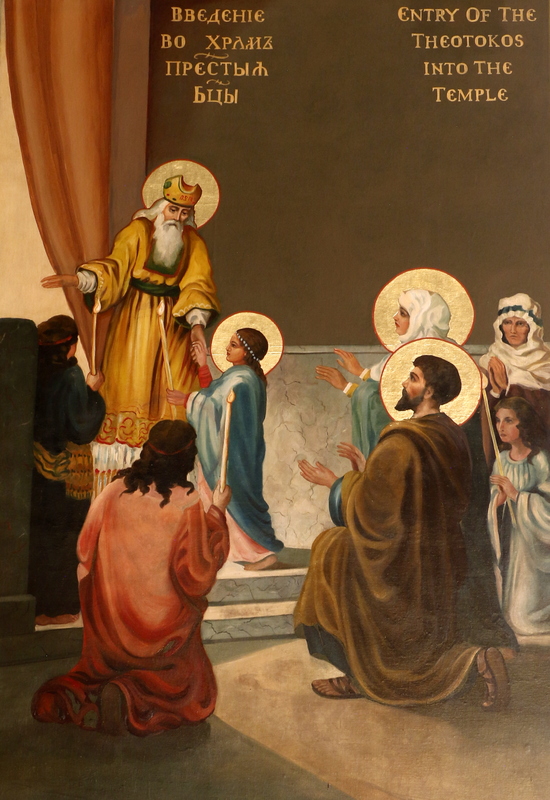 Then the High Priest, through inspiration from above, led the Most Holy Virgin into the Holy of Holies, where only the High Priest entered once a year to offer a purifying sacrifice of blood. Therefore, all those present in the Temple were astonished at this most unusual occurrence. After entrusting their child to the Heavenly Father, Joachim and Anna returned home. The All-Holy Virgin remained in the quarters for virgins near the Temple. There She grew up in a community of pious virgins, diligently read the Holy Scripture, occupied Herself with handicrafts, prayed constantly, and grew in love for God. In the icon, the infant Mary is shown as a child, wearing the clothing symbolic of perpetual virginity. She is rising towards St Zechariah at the entrance of the Temple, dressed as the High Priest, who stoops down to greet her. In her wake, she leaves her parents Saints Joachim and Anna and the retinue of young maidens who accompanied the holy family to the Temple.